As you know, Jogja now has four mall (Malioboro, Galeria, Saphir, and Ambarrukmo). The last two mall were build in the last two years. I remember when i was a child, i was very proud with Malioboro mall and i enjoyed very much when i had time to go there. Next was Galeria mall. At this mall, Fantasia and Time Zone was available for the first time in Jogja, most youngsters came to this place instead of Malioboro Mall, since they could play and have more fun at this place. One thing that surprised me, Malioboro mall still exists, even though the visitors was dramatically reduced after Galeria mall was opened. Next is Ambarrukmo and Saphir. This two malls were located near Galeria and their opening date was also not to far different. When they were opened for the first time, people choose to go to this mall instead of Galeria, so there has been a migration again. When an earthquake struck Jogja last year, both of this mall were suffered from cracks, but Saphir had the most damage. Amarrukmo only took several weeks to recover, while Saphir need longer time, since they had to fix most of the buildings. One year has passed and both of this two mall are going more advanced. Amarrukmo has provide a movie theater again for Jogja (there was an Empire 21, but it was burnt to ashes) and Saphir is planning to build an entertainment center on their second floor. Right now they are holding an International Snow which will be held until next month and in the future, they will build several entertainment center, such as Ice Skating, Bowling Pool, and Billiard. I think this is great news and people will have more choices when they come to Jogja in the future. Playing with Regex is fun, mostly when you are dealing with content parsing (for example: grabbing content from a site and process it into a RSS Feed). By using Regex, you can do a lot of automation, since regex is some kind of string of pattern which can be used for several purposes, mostly for matching, splitting, and replacing data within string data. For those who are interested in Regex, please have a look at Wikipedia which contain lots of information and resources about Regex. Telkomsel have a new (or it was me who didn't know this until right now) feature called "Telkomsel Pelindung Dataku". I knew about this service when i checked my credit by dialling to *888#. It can be accessed via *989# from any cellphone which use Telkomsel product (i'm using Simpati, but i think it should be available for other product as well, such as Halo and AS). Ini adalah layanan Telkomsel Pelindung DataKu. Untuk informasi lebih lanjut, kirim HELP ke 989. It's very useless. I don't get any information about this service at all, instead they asked the consumer to send a SMS to 989 to get information. Why don't they write them down from the beginning, so that users can directly send to 989 instead of requesting 2 and got nothing? So i tried to send the message to 989 and i got 4 replies which gives detailed about how to work with this services (including registration and how to unsubscribe from this service). After reading the messages, i finally knew that this service is intended to save your contact detailed on their server and you can access it on every cellphone as long as you used Telkomsel products. The problem is that you will have to add it one by one and that took some time (and probably some cost to send via SMS). For me personally, i don't think it's quite usefull. PCPlus, a bi-weekly computer magazine has never updated their website again since last February. The current issue is 286 and the last issue that was submitted on that page was 277. I wonder why this happened, since they can use that website to interact with their readers. In the past, the website was updated by Sukarja (please correct me if i'm wrong), but i think he already left PCPlus team. I know that their mailing list is quite large with huge amount of members (6455 members as i wrote this post) and also has high frequency of posting (about 2000 post per month) but a website is also important. Do you have blog that use WordPress and you are bored with the default theme? If yes, then you might try to see this article from SmashingMagazine about 21 elegant wordpress themes. There are also 83 Beautiful Wordpress Themes You Probably Haven’t Seen, 8 Fresh And Clean Wordpress Themes and 10 Fresh, Elegant and Clean Wordpress Themes. Next thing is testing it whether a call to my cell phone number i registered to E164 will be forwarded to my VoIP Rakyat account. Today i went to Plaza Ambarukmo with my girlfriend as usual and she bought me a headset, including a microphone (in an exchange for a MMC card i bought for her new mobile phone) so i can have a chat using VoIP technology (I used VoIP Rakyat for the provider and X-Lite as the softphone client. It's available on Windows, Mac, and Linux platform so it encompasses the three biggest platform available. 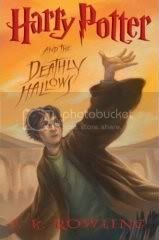 Someone called Go Harry has published a full disclosure of the ending story of Harry Potter 7 (he/she named it Harry Potter 0day) in InSecure.org which made the traffic on that site goes wild. This person is not an official person, but a hacker who infiltrated the web server and post a news about it. Up to now, there's been no confirmation about the validity of the story, but if you are really curious, you might see it from this link (NOT recommended for true Harry Potter fans. It's suggested to wait until the book is officially released on July 21). InformationWeek has released a review of 8 IPod Alternatives. It listed several alternatives for all of Apple's product (IPod family), which includes IPod Shuffle, IPod Nano, and IPod Video. Microsoft Zune is also included (in the IPod Video alternatives category). But unfortunately, you probably won't be able to find some of the products in Indonesia. You will have to order via online or go to other country or ask your friend to buy it for you when he's in abroad to get them. They will release 9.5 weeklies in their blog so people can start testing it before it became the final release. Meanwhile, Safari also released another update to their beta version of Safari 3.0 for several platforms. Apple does really worked hard to improve their product in the last two weeks by releasing several build so users can see what improvements that already exist on the latest build. I got a lot of lessons today, as i usually never dealt with those application, but after i saw the demo, i'm quite interested on those application and i'm trying to try to install those apps on my laptop for testing purposes. I got lots of emails from Indonesian Linux Forum since i have changed the registration method from email to admin, with some consequences that i had to approve all of the users that has registered to the forum before their account is activated. It's being set like this to minimize the spammers who got through the system and flooding the forum with spam messages. Right now, i have never seen a spam message from a robots just like before. PING forum.linux.or.id (67.19.121.27) 56(84) bytes of data. But when i tried to connect to that site via browser, i couldn't get anything. I think Ronny is changing the DNS entry so it's propagating now and i will have to wait until it's finished before i could start browsing the forum again. Update (22 June 10:47): Indonesian Linux Forum is now up and running again, thanks to Ronny (and the hosting). Looking for an example of AJAX applications? Well, SmashingMagazine has published an article about 80+ AJAX-Solution For Professional Coding (it's already more than 90 solutions, but since the article is already published, it's not good to change the title, as it might change the file name also). Solutions are categorized, so you can look for the right category instead of looking at them one by one. 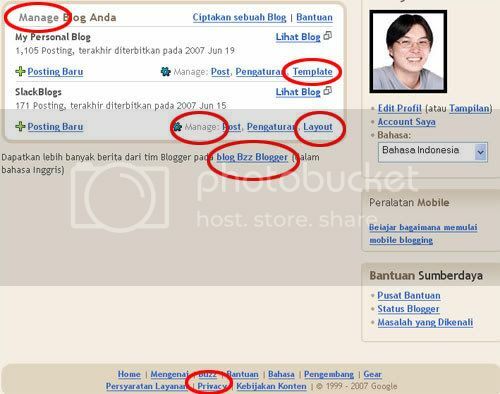 Whoaa.... Blogger is now available on Indonesian Language (and also a lot of other languages). The language option will be displayed on the dashboard page (after you logged in). Not every strings have been translated to Indonesian language and some are funny to read, since i'm used to with English words. Some string is still inconsistence. For example, the Preview has been translated into "Pratinjau", but Hide Preview is still being translated as "Sembunyikan Preview". I highlight some of the parts that still needs to be updated in the dashboard page on the screenshots below. The Buzz Blogger information is also not displayed on Indonesian settings (probably it's only displayed on the English language). Today is the first of four day Workshop held in Duta Wacana Christian University with Dr. Onno W. Purbo as the speaker. Yesterday, the seminar was held and about 160 people attended the seminar (most of them were the attendance of the workshop that is held today and in the next three days). Today's material is some theory about how to make an antenna and followed with a real time workshop by making an antenna. Too bad i didn't have the photos yet, since the session is still up and running at the time i wrote this post, so the photographer is still busy taking pictures. This email was once my primary email since i used Citranet, but when GMail arrives, i switched to GMail since it has bigger quota and also free. Other important reason is ISP independence. When i'm using GMail, i could use any ISP to retrieve and send my emails, but if i use the email account from my ISP, i would have to use that ISP to send an email (well, i could find an open relay SMTP Server, but it's better to stick with the ISP). Lately, this email account was filled with spams, so most of the time, i checked my account and delete the spams and if somebody has send me an email there, i would reply them and asked them to reply to my GMail account in the future. But since it's gone now, i don't think i can do that anymore. I guess i have to make sure that this account is not used anymore on most of the services i used on the Internet or i will have problems in the future just because it couldn't find the email address. I think most of people who had mobile phone/cell phone wouldn't leave them behind when they are going somewhere right? Nowadays, people is used to have cell phones as it's more efficient for communications means as it's portable and the cost is getting cheaper and cheaper (not only the rate, but also the cell phone itself as new products comes in all the time). This time i will talk about one of my bad habit related to cell phones. When i go somewhere, i usually set my profile to silent which will not ring when a SMS message came in or somebody phoned me. Instead of ringing, i set the phone to vibrate so i will know if there's a SMS/call (you can indicate them by how long the vibrate happened. Usually a SMS will only last for two times, while phone call will occur as long as the caller didn't hung up the phone). Why would i choose this settings? Because in some places, people don't like when there's a ringing tone, for example when you are in a movie theater, church, library, etc. Well, so far so good right? Setting silence profile is not a bad habit of course, but what happened after i got home is the bad habit. Most of the time i never switched my profile back to the general or "ringing" profile, so sometimes i missed a call from somebody just because i didn't notice that somebody has called me. It just happened. My colleague sent me a SMS message while i was watching a movie at home and i didn't notice it for about 2 hours, since probably i wasn't at the room when the phone vibrate and when i started to watch the movie, it already stopped. It appears that it's not a big deal, but sometimes, you do have to switch your ringing tone setting to on, since you never know what will happen in the future if you forgot to ring it and you missed a call from someone who is important or an important information should be told to you but you aren't there just because the phone didn't ring. I think i should make a shortcut which will ease me to switch profiles on my cell phones. One of my (bad/good, i don't know) habit when i go to a shopping mall is to go to the book store and usually i never skipped this part unless i have little time or i'm on other purpose and i'm in rush. So today i went to Malioboro Mall with my girlfriend and when i wanted to go to Gramedia book store, i stepped by at Periplus, which is near Gramedia. When i saw the imported book section, i saw a novel about WarCraft, World of WarCraft, Diablo, and StarCraft from Blizzard and also some other game which is converted into novels, such as Halo 2. There are also some other hot new book, such as Fantastic Four 2 which is now available on movies theater. They are not translations, so it's in the original language: English. The books were telling about the idea of a WarCraft, so if you have played the game, you probably know most of the content of the books. If you would like to see the complete list of the books, you might want to go to the online store (you will find more than just a book here). Apple has released an updated version of their beta version of Safari 3.0 for Windows platform. The updated version is dubbed as 3.0.1 (522.12.2) Beta (I got this information from Majorgeeks). I think this is Apple's answer to many criticism for their first beta release of Safari 3.0 for Windows platform. I really really hope that this version will be much better, secure, and stable than the previous beta which i think shouldn't be released to public yet. It's too buggy for something which suppose to be very secure (at least that's what the developer said for their campaign). I haven't changed my decision to wait until the final version comes out, but i'm really happy that Apple does give quick response to bug reports which is already publicized. On June 15, there will be a great event in Jogja, called Snow International with a theme "Bersalju di Jogja" (Snowy in Jogja) which will be held in Saphir Square. Great, since finally i have a good reason to go to Saphir (believe it or not, i haven't been to Saphir ever, even though i have been in Jogja for about one month after i came back from Jakarta). The grand opening will be on 10 - 11 AM and after that, it will be open for public. There will be a lot of ice craft and it's being crafted by seven famous ice crafter and became the world champion. The room temperature will be kept for -15 degrees to preserve the ice. This event will last for about two months, so you still had a lot of chance to see this event (just plan to go to Jogja in weekend). When i heard the availability of Safari's public beta for Windows platform this morning via RSS, i was very interested. For some time, i wanted to test Safari since many reviews has spotted that Safari is one of the best browsers in the world, due to it's feature and fast rendering engine, but since i don't have Macintosh, i couldn't do it. So when Steve Jobs has announced that the next Safari 3.0 will be on Windows, i was planning to download and test the product ASAP, but since i had an activity this morning, i postponed it until this evening, until i read about a story which makes me reconsider and postponing it a little bit longer. I know, this is not the final version and non-final usually does have bugs (no software is 100% clean and safe), but i guess the developer team should have noted this bug before they release it to public (or perhaps because they were forced to work on IPhone and abandon Safari?). Some of the crashes are easy to reproduce, which somehow shouldn't be there. I agree with carrotmadman6 to wait until the final release appears next October. There will be a lot of homework for Apple developers (releasing IPhone, finalizing Leopard, and fixing Safari 3). I hope the final version will be better, more stable and secure as it promised. OOo lovers, get ready for OOo 2.2.1. It's out there (but not officially yet, since OOo team is waiting for mirrors to grab them, but you can get them from some mirrors, such as GDS). Don't worry, it's already final as it resides in stable directory. No release not for now (but it will be available as soon as there's an official announcement from Louis or John). I'm downloading them now and looking forward for the improvements integrated on this release (don't hope too much for new features, as it only a maintenance version). Update (20:15): Release note has been published and the website has been uploaded, but not displayed yet in the download page. In some sites, we have seen a lot of random words (or characters) that has to be inputted when we want to submit something (register to a forum, add a comment to a weblog, register an email account, etc). It's called CAPTCHA (Completely Automated Public Turing test to tell Computers and Humans Apart) or HIP (Human Interactive Proof). The purpose of this technology is clear: to tell whether the submitter is human or computer (in forms of bots, which might be a spammer in most cases). In most cases, bots are unable to see the characters since it's being displayed as an image, so they have to analyze it deeper in order to solve that puzzle (even though there has been a lot of reports that nowadays spammers has find a way to read an image text created by CAPTCHA). The other problem with CAPCTHA is that sometimes, the words is too scrambled or fuzzed, so it has created more problems than solving problems. Some people had to retry for several times before they can be considered pass the test. For something important, this is acceptable, but if for something simple, this is annoying. For that reason, a new project has been started by Microsoft, called Asirra (Animal Species Image Recognition for Restricting Access). 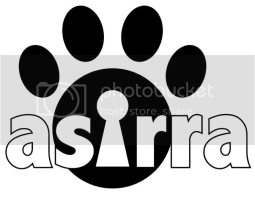 Instead of using words, Asirra will ask the audience to identify photos of cats and dogs. This task difficult for computers, but people can accomplish it quickly and accurately (unless they haven't seen a dog or a cat or any pet before). Asirra will use Petfinder as their partner for providing them with the images they need. So far, they provide two millions of images for Asirra project, which is quite huge (remember, we can randomly mix this images, so there are a lot of combinations here). Asirra's idea comes from HOTCAPCTHA which uses "hot" human photos to proof that the audience is human or computer. When i published my Load Runner post, the page should display a link to a video from YouTube, but unfortunately, the object is not included in the atom file of Blogger, so it won't be displayed as well in the Planet Terasi, since they only look for the content of the atom file. It's quite strange, since when i look at the Preview, the video showed up, but when i published it, it wouldn't showed up in the RSS feed. I don't know how to solve this problem, since it's blogger's authority to provide the feature, but i do hope they will solve this problem. Yahoo has began to give automatic updates to their IM client (I think it's started after a release which fixed YM's bug related to ActiveX web cam controller). This morning i got a prompt to update to a newer version and Yahoo will download the updates and installs it. It's faster since it will only download the patches rather than downloading all of the packages. Two thumbs for Yahoo Developers. It's time and bandwidth saving for the consumers also. A nice Load Runner video which was made by ASCGEN2 project. It's often called ASCII Generator in the past and now it has reached version 2. It is an application to convert images into high quality ASCII art - text that accurately represents the original image. Few days ago, i saw an article in EWeek about a computer failure which was considered the worst flight delays of the year. The failure was in the air traffic control which is a vital components of an airport since it controls the schedule of flights. Without it, then the schedule will be messed up and plane could get crashed while they're trying to arrive or depart. One thing that made me amazes was that as soon as the air traffic control in the Atlanta failed, the backup system which was placed at Utah took control of the main system even though it's quite over loaded as well. My point is that they have a contingency plan to reduce the risk when something bad happened. The previous case was down for about two hours, but it's already considered the worst case of the year. I wonder how long will it need to be considered the worst case in Indonesia? Indonesian Air Traffic Controllers Association (IATCA) has urged the government and DPR to rush the discussion of the Flight Regulation Plan to realize a single provider air service (detailed information can be seen at Angkasa Pura II). I hope they started to realize that disaster can occur anytime and they should prepare for contingency plan or else there would be a major disaster for Indonesian air transportation. When i was working with my computer, suddenly the explorer restarted and there was an error message saying that it couldn't find ordinal 110 in the dynamic link library shdocvw.dll. I couldn't start explorer, the file manager. It kept displaying the same error messages, so i tried to look for the explorer.exe file in C:\WINDOWS. It's not corrupted, since i compared it with the same file on my laptop, so next, i checked the dll file and my guess was correct. The file has difference in size, so i tried to copy the dll from my laptop to a flash drive and tried to overwrite it, but too bad. Windows wouldn't detect my flash drive, since the explorer couldn't be executed (i think everything is controlled by explorer). * Letters, Q&A, MyDesktop screenshot, MyPC photo, Top5 and more! You can also grab the preview edition of #0 edition, which only consists of the history of Ubuntu, Kubuntu, Edubuntu, and Xubuntu and how to get Ubuntu. For some time, some members in Linux Forum had asked for quick reply feature so that they can reply quickly without having to open new page and wait another loading time which is sometimes time consuming (for slower connection). It's actually a simple task, as there are a lots of phpBB hacks around and a lot of forum has used them and it's working well so far. One of my concern is compatibility whenever a newer version of phpBB is available, since most of the times, the file will be overwritten by the new version, so the modification has to be repeated again and rechecked for compatibility. Other reason is the amount of theme installed. For every theme, i had to update the files (including the language pack, since currently it's available on English and Indonesian language). If you are searching for historical data of GNU/Linux distro, i think you might find the graphs in LinuxLinks worthed to look. It shows you a Linux distro time line from the beginning up to now (well, it's not meant to show full list of distro, since there are more than 100 of them listed in DistroWatch. I think only big distro that were listed there). I cannot put the image on this blog since it's very big (1860x1984 pixels), so i just gave you the link. I thought that the first Linux distro was SLS, which is Slackware based on, but i was wrong. According to the graphs, it was MCC Interim which was released in early 1992 and it was developed until mid 1995. Slackware and Debian was released in 1993 (Slackware was released a bit earlier then Debian) and it's still an active distro up to now. It's very easy to get infected by virus/trojan in Windows this day. Opening an email from unknown person might get your computer infected, or even worse, just by clicking an ads on the Internet might drop your computer a trojan or even backdoor. Even if you are using Vista (the latest version of Windows operating system which should be more secure , you still had this kind of problems). Since 1 PM this afternoon, my Speedy connection was down and came back online just now (about 11:30 PM). The customer service said that there was a cut cable on Pantura, so i was guessing that the access from Jogja to Jakarta would have problem, but i sent a SMS message to my friend in Jakarta and the connection was only down for a few minutes and then it went up again. Strange, so the problem was not global, but only applies to certain areas. I called 147 again at 10:45 PM and he said that Jogja still had a problem and he couldn't predict when will the problem be solved, so i just waited. At about 11:30, i opened a command prompt and i tried to ping some sites (i usually use GMail or Yahoo Mail site as the reference, as i usually open foreign sites) and it gives me reply, so i assume the connection has been restored. So i opened up my browser, and yes, it's already back to normal again. Hm... that was quite long. It lasted for about 10 hours. Anybody else had the same problem as i did? Today, Linus released RC4 for the next 2.6.22 kernel release. It's getting stabilized and no major changes there, except for patch-checking script. In this RC4, ALSA project has committed ALSA 1.0.14, which means the next final kernel will include the latest version of ALSA. Some developers had also fixed some problems that is related with ALSA sub system. Look LWN Article for human readable changelog, or long format Changelog (quite fuzzy) or wait for updates in KernelNewbies. If no big regression occurred after this release, i'm quite confident that the final kernel release will be available at the end of this month (meaning this is the last RC) or perhaps beginning of next month (meaning there's one more RC before the final version, just to make sure everything worked as expected). On 18-22 June, my campus hold an event with Onno W. Purbo as the speaker (it's great to hear that he has recovered from his ill, even though not 100% yet). There will be a one day seminar and four days of workshop. The seminar is open for public, but for the workshop, it's intended for internal student, because it was offered like an ordinary class. The workshop will use Ubuntu as the operating system, so in the past two weeks, we have been quite busy preparing the lab for the events. Right now, most of them have been installed with Ubuntu Feisty Fawn (7.04). Some installation was painful, since the hardware is not that high, but when the RAM was upgraded, everything became painless. Installation was quite easy and quick and everything worked perfectly. Today, i set up a new server using Ubuntu-Server edition for repository purpose. This server will hold all of the 4 DVD of Ubuntu's repository and it's already running well. Why would i prepare a special repository and not using the Internet to get the packages? It's about efficiency. Just think if for example 100 users are accessing Ubuntu's repository at the same time and downloading the same packages. It would be time consuming and not efficient. The process will be faster if we set up a new repository which holds all of the packages needed and set the apt's source.list to point to that repository, so it will grab it from one central repository (and it's local, so it should be faster). I really enjoyed playing with apt-get as it's very easy and it will find the dependencies for you automatically, so you don't have to bother about it at all. It doesn't mean that i'm going leave Slackware and switched to Ubuntu since Slackware is still my favorite for now (and probably will still is in the future). It's just nice to know and play with Ubuntu. Today, i upgraded my PHP application on my laptop to the latest version, PHP 5.2.3 and when i ran several test on my local web site, i found an error, which has to do with threads. It output an error message : "Error in my_thread_global_end() : 2 threads didn't exit". I checked other page, and it wasn't displayed, so i guess it's only specific to some certain of the program, so i debug the program, but i couldn't find any defect on it, so i checked Google, and i found similar problem at MySQL's Forum and also the solution. It's still unsure which side make the code broken, but at least we have the solution, which is replacing the libmysql.dll file from 5.2.3 with the same file from 5.2.1 version. As soon as you replace the file, the error will gone. I had to re-download the file again as i have deleted it from my local hard disk. I have tried to use 5.2.2, but the problem persists, so you should use 5.2.1 in order to have full fix. I just watched a video from YouTube that presents Linus at Google Talk at their home base and talking about SCM. You can watch the video here (quite long, 73 minutes), but if you are a CVS/SVN users, please be prepare, as Linus REALLY REALLY doesn't like those two products, and insult them quite badly. Well, i found his reason does make sense, but i think that it depends on the situation on the projects and the organization. You should see it for yourself, and start thinking about it. I got the video after i read this blog. If you saw the changes in the next 2.6.22 kernel from KernelNewbies, than you might know the idea of this post. The next Linux kernel will bring lots of new things and you will have to deal with it at configuration phase (it always happened in a new final kernel release, but i think it will be one of the most question been asked). Lots of new drivers and technology (SLUB and UBI) are being merged in this release. It also add one new architecture, called BlackFin. It's going to be a big release, along with other updates that has been merged until RC3 so far. I hope the final release will be as stable as before, considering this is a big updates, but i believe that the kernel developers are able to stabilize things up before the final version is released, thus we will enjoy a nice and stable kernel working on our system. Really Fast Boot, Is It Possible? I would like to see very fast boot under 10 sec. Is it possible ? At first, i thought this guy is joking. I don't think a normal desktop/laptop could boot in less than 10 seconds (for now, but it's possible in the future), since it has to do lots of things in the background/foreground, such as initializing services, loading kernel modules, and do lots of things before your system is ready to be used. I give a bold statement on normal word, meaning that i assume you are using standard hardware specification that is available now for most home users, not a high class hardware specification that was designed for high end server/clusters. In just less than a month, PHP has released another update for PHP 5 series, 5.2.3. It fixed some security issue as well as regression caused by the previous release. This version also added new option in php.ini to protect the application by limiting nesting level of input variables which fixed MOPB-03-2007 as well. Please see the Changelog for detailed changes on this release. Finally i had a chance to try the new BETA Web-Based YM service from Yahoo!. It's quite impressive and responsive. It has most of the basic feature we had on YM application, but some feature are still unavailable, such as Audible or Environments. It also uses tab to show all of the friends we are talking to, like Pidgin's interface. Too bad, since this is a web-based, my YM Status Changer application will not work anymore, since it will only work for desktop-based YM application. Btw, here's the screenshot of the web-based YM.